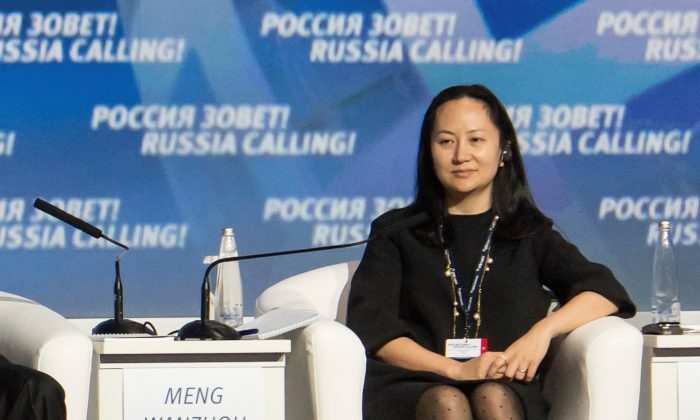 Soon after Meng Wanzhou, the chief financial officer of Huawei, was arrested by the Canadian authorities in Vancouver, the Chinese regime prioritized her release. Meng was arrested at the Vancouver International Airport on Dec. 1 at the request of the U.S. government, which alleges that Huawei, one of China’s flagship telecom companies, violated sanctions restricting the sale of most goods to Iran. When the news broke in the Western press, the Chinese regime had a strong public response to the incident, detaining two prominent Canadian nationals in China and encouraging a boycott of Canadian apparel company Canada Goose. This and other actions suggest that Meng is of great value to Beijing. Meng is accused of committing fraud because she told banks in the United States that Huawei and Skycom, a Hong Kong-based company reportedly doing business with Iran, had no connections. However, the court heard from lawyers representing the Canadian government that Huawei effectively controlled Skycom. The Chinese Communist Party (CCP) has deployed its national security, media, diplomatic, and other channels to support Meng and Huawei. Since Dec. 7, Geng Shuang and Lu Kang, the spokespersons of China’s Ministry of Foreign Affairs, had criticized the arrest and the possible extradition, and urged Canada to release Meng. On Dec. 8, Le Yucheng, China’s vice foreign minister, summoned Canadian Ambassador to China John McCallum, and demanded that Canada release Meng, saying that “otherwise the consequences will be serious and Canada must bear full responsibility,” the state-run news agency Xinhua reported. On Dec. 10, national security agents in Beijing detained former Canadian diplomat Michael Kovrig, who is now being accused of espionage. Kovrig’s manager, Robert Malley, has denied this allegation. The same day, Canadian businessman Michael Spavor was detained by Chinese authorities in the northeastern province of Liaoning on the same charges. Spavor is close to North Korean leader Kim Jong Un and runs a business promoting tourism and investment in North Korea. Meng was released in the evening of Dec. 11 on bail. Soon thereafter, the Chinese consul-general in Vancouver, Tong Xiaoling, and two other officials from the embassy visited Meng at her home in the morning of Dec. 12. They spoke for about an hour and a half before being seen off by Meng and her husband. Meng is living under surveillance and is being guarded by the Royal Canadian Mounted Police (RCMP) to prevent Meng from attempting to flee the country or contact Chinese regime agents. Global News reported on Dec. 14 that Meng was also being watched by agents from the Chinese Ministry of State Security (MSS), which conducts intelligence operations abroad. Three provincial-level Communist Party secretaries have visited Huawei’s offices to show solidarity with the state-linked company. Du Jiahao, the secretary of Hunan’s provincial CCP committee, visited Huawei’s software office in Changsha on Dec. 11. Liu Qi, the Party secretary of Jiangxi Province, visited Huawei’s Yingtan office on Dec. 12 and 13. Chen Hao, the Party secretary of Yunnan Province, visited Huawei’s Dongguan campus with Ruan Chengfa, Yunnan’s governor, on Dec. 13 and 14. Huawei is China’s largest telecommunication company, and is deeply involved with the CCP’s strategic goals in China and overseas. In October 2011, the CIA-based Open Source Center published a report showing that Huawei had links to the Ministry of State Security. Prior to that, in 2010, eight Republican U.S. lawmakers raised national security concerns that Huawei had sold communications technology to the by then deposed and executed Iraqi dictator Saddam Hussein, the Taliban, as well as the Iranian government, military, and Islamic Revolutionary Guard, all of these parties being the targets of U.S. sanctions. Huawei has a long history of supplying militant groups around the world. In 2001, Indian intelligence agency reported that Huawei India allegedly helped supply communication surveillance equipment to Taliban forces in Afghanistan, and also sold telecommunications equipment to Pakistan, India’s main strategic rival. Huawei has its Indian branch in Bangalore, and launched a Research and Development Center there in 1999. As of this year, it employs more than 4,000 software engineers and market technical support engineers there. Given that Huawei was charged with the sale of telecommunication systems to the Taliban and other rogue groups, it’s likely that Meng Wanzhou has knowledge not only regarding Huawei’s deals with Iran, but the company’s other illicit business relations. The South China Morning Post reported on Dec. 6 that in an internal company meeting on Oct. 29, Meng had shared her views with her father Ren Zhengfei, the founder of Huawei, on compliance with international sanctions and other ordinances. Both father and the daughter said that Huawei needed to keep the costs of “compliance” with sanctions under control, categorizing different kinds of illicit business into “red” and “yellow” groups. While “red” indicates sanctions that Huawei has no choice but to abide by, “yellow” sanctions imply those that Huawei has determined it can bend, the newspaper reported. Meng’s words at the meeting suggest that she is fully aware of her company’s widespread violation of other regulations around the world, including those imposed by the United States, Europe, and the United Nations. This would give the CCP regime a powerful incentive to secure Meng’s return to China and prevent U.S. judicial authorities from obtaining her extradition from Canada.